What follows is my talk for a session at the 2012 MLA on “#alt-ac: Alternative Paths, Pitfalls, and Jobs in the Digital Humanities.” I’m thrilled to be speaking on the panel with a fantastic collection of alt-ackers that I admire: Julia Flanders, Matt Jockers, Shana Kimball, Bethany Nowviskie, and Lisa Spiro. I’m tremendously pleased to see this panel and the one that directly follows it happening at this year’s MLA. The need for ongoing conversation about alternative academic careers was brought home to me again recently when I received a rejection notice—a very kind one, I might add—for a tenure-track job that I applied to this fall. Nine hundred applicants. You don’t need statistical analysis or to be a digital humanist to figure out those odds. As Amanda Watson put it on Twitter, these sorts of odds make it clear that we must rethink graduate education and not ignore different paths for employment after the PhD. And that’s exactly what alt-ac can be. In my current position as a CLIR post-doctoral fellow at Emory University’s Woodruff Library, I’m lucky to be exploring the alt-ac track. 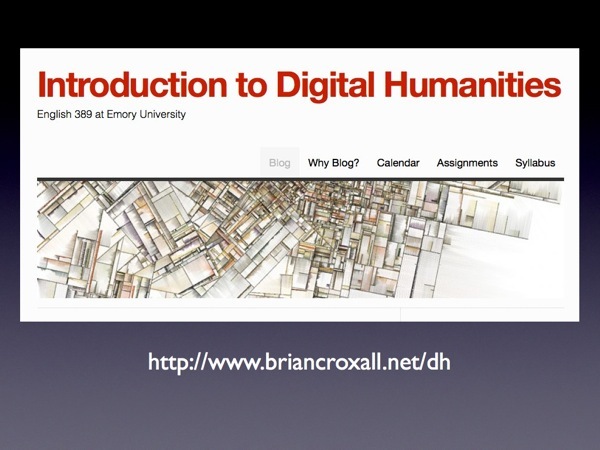 My principal responsibility is to develop and manage digital humanities projects in DiSC, Emory’s Digital Scholarship Commons. 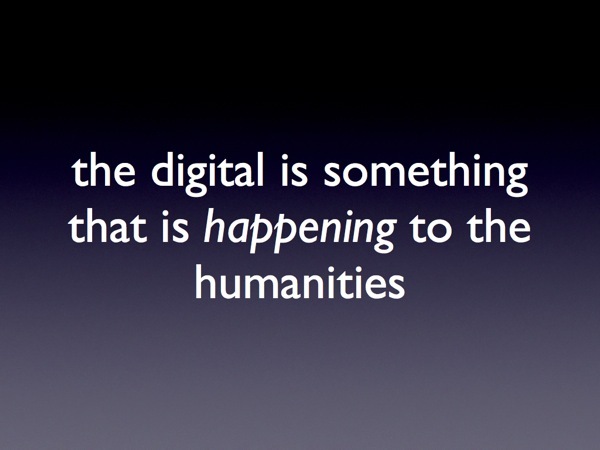 I also taught an Intro to Digital Humanities this semester. 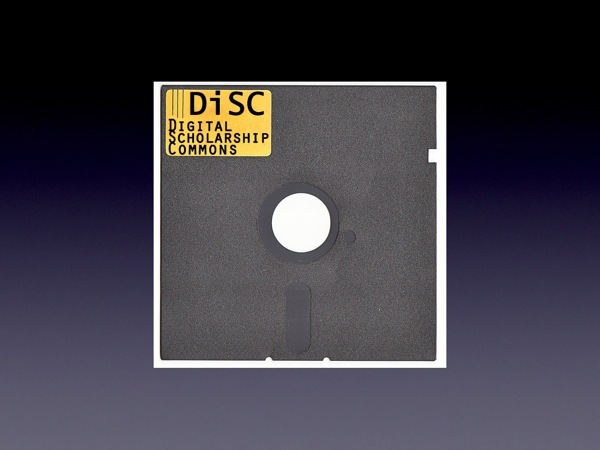 In the past year, I worked to get DiSC off the ground, along with three colleagues. All of us are on the alt-ac track together. What’s the relationship between DH and alt-ac jobs? As many of you may have seen, Stanley Fish recently had a piece in The New York Times, where he talks about the rise of the digital humanities at the MLA. His observation is a bit behind those (Howard 2009; Pannapacker 2009; Howard 2011; Pannapacker 2011) who made similar statements about the 2009 and 2011 MLA…but we’ll give him a break. He is Stanley Fish, after all. What you might not have seen was the very smart response to Fish from Ted Underwood, who teaches eighteenth- and nineteenth-century literature in the English department of the University of Illinois, Urbana-Champaign. Underwood suggests that one of the reasons why DH is not the future of literary studies is because it “is not a movement within literary studies.” It’s equally at home in history departments (the slate of DH activities happening at the AHA right now certainly bear witness to this fact), in art history, in linguistics, in libraries, and many more corners of the campus. 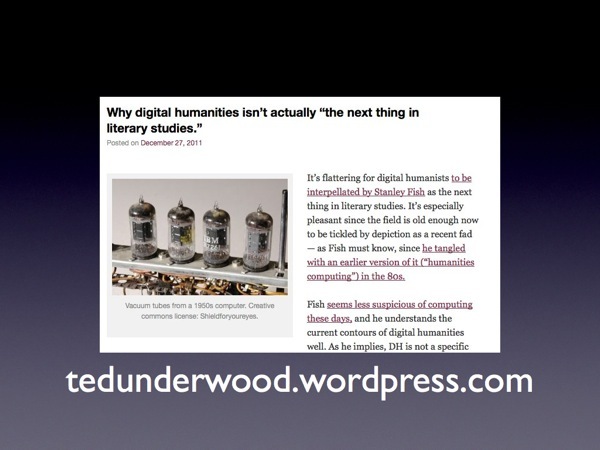 Underwood calls digital humanities “extra disciplinary.” We might say the same thing about alt-academics. One of the obvious connections between DH and alt-ac, then, is how extra-disciplinary they both are. 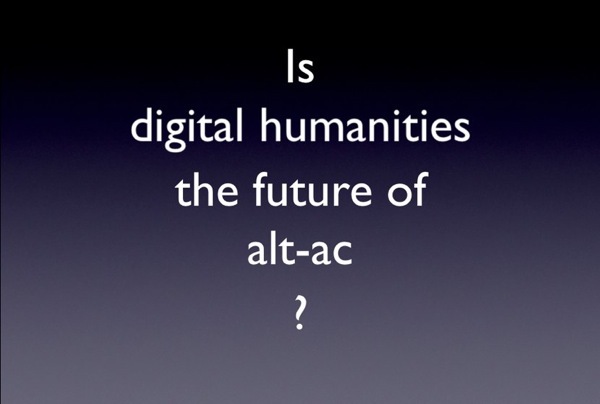 Question #2: Is alt-ac the future of DH? Well…not entirely. We have the creation of tenure track positions—and occasionally cluster hires—at places such as Maryland, Nebraska, Iowa, Clemson, Northeastern, and more. These positions are clearly not alt-ac. But insofar as scholarship in the Digital Humanities tends to require collaboration on multiple scales, those in these positions will in fact be “alt”—marked by difference. The pursuit of tenure for these scholars won’t be the same as those who have previously been promoted. 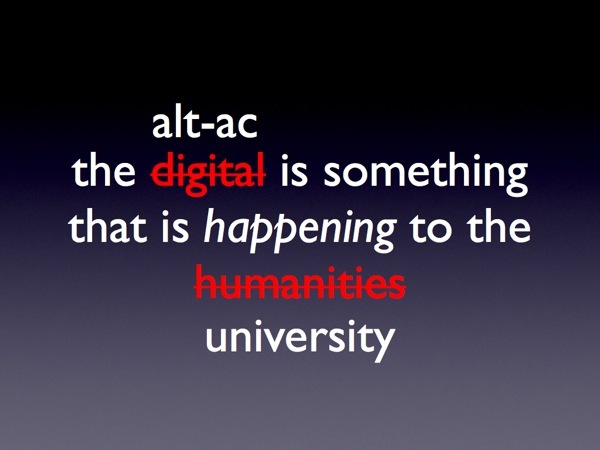 What’s more, I think alt-ac is the likely track for most positions in the digital humanities—and probably for the university as a whole. In fact, let’s face it: the university is already primarily populated by people who are non-fac. And many of the non-fac are the alt-ac. That being said, alt-ac cannot mean short, terminal contracts; alt-ac cannot be a continued casualization of labor in the university. Instead, we should look to models elsewhere in the university—libraries, administration, research only positions—for helping us structure these career paths, both within and without DH. What’s more, these must be career paths. We need to think about how to create opportunities for advancement. Now let’s turn it around (question #3, by the way): Is DH the future of alt-ac? There many different ways to get your “alt on” that don’t involve building things (as Stephen Ramsay would have it). You can find alt-ac careers in a library, in a museum, in an archive, in a federal agency, in a think tank, or even—dare I say it—in administration. 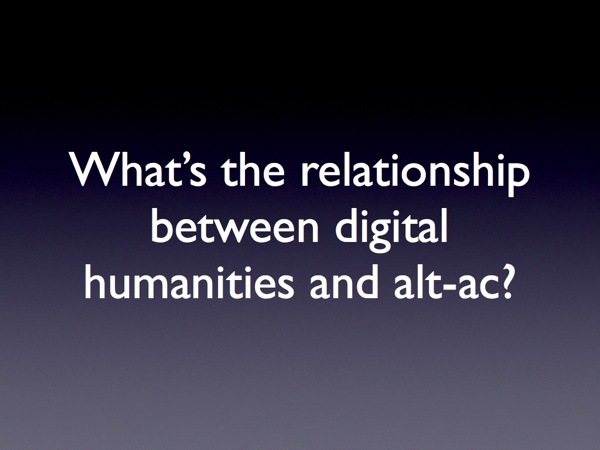 So it’s not necessarily helpful for us to frame alt-ac as only being a thing that happens in digital humanities. Again, one of the lessons of “alt-ac” as a concept is that there is intellectual labor in getting things done, in accomplishing the very impressive and real work of the university, throughout the whole university. 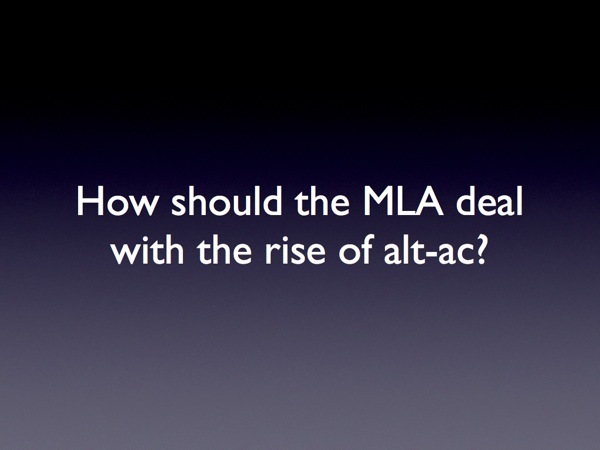 And finally, a question (#4) that I’ve heard no one ask aloud: how should the MLA deal with the rise of alt-ac? After all, sessions like this have little to do (on the surface at least) with the study of the modern languages. 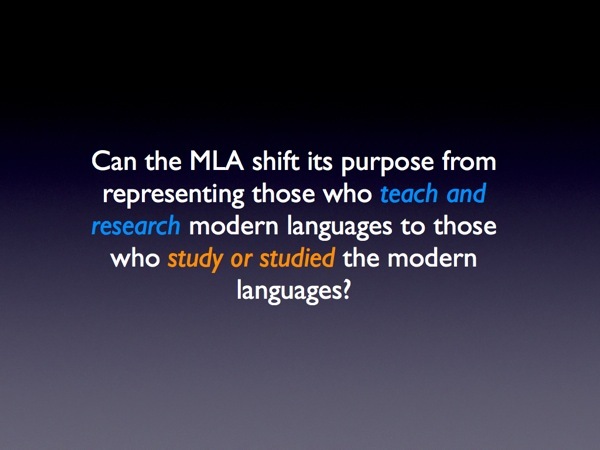 Can the MLA shift its purpose from representing those who teach and research modern languages to those who study or studied the modern languages? This simple shift would be enough to make the whole of what we’re discussing—to say nothing of the panelists—belong unequivocally at this annual Convention. I’m not sure that it’s something that alt-ac needs so much as a way to keep the MLA relevant with what the transformations we’re facing. More than either an object or method of study, the digital is something that is happening to the humanities in the 21st century. And alt-ac is something that is happening to universities. It is not the only thing nor is it necessarily the most important. But it’s happening and in some cases it’s a very good thing. Perhaps in 2017 (or ’18 or ’19) we’ll be reading a piece from Stanley Fish talking about the rise of reconfigured, hybrid professionals at the MLA. And if in 2018 he’s a few years late in noticing the rise of alt-ac, well, so much the luckier for the rest of us who will have been the beneficiaries of the future’s accelerated arrival. 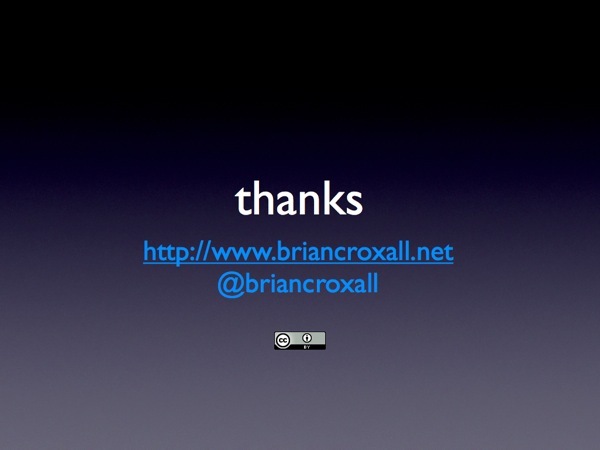 This entry was posted on January 7, 2012, 6:45 pm and is filed under alt-ac, Presentations. You can follow any responses to this entry through RSS 2.0. Both comments and pings are currently closed. I added more content to http://alt-librarian-careers.blogspot.com/ last night, including a job post that was PhD preferred. I am collecting ‘non-traditional’ non-library positions at that blog, that have a librarian’s skillset in their core. Many of these positions are not ‘entry-level;’ so I thought that the blog would be of interest to those who read your site. 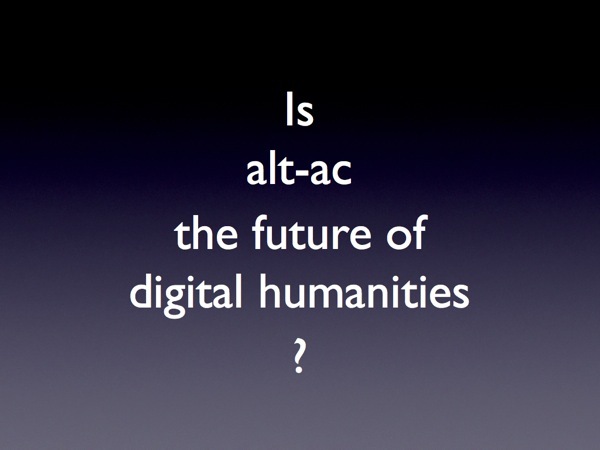 Related session: “#alt-ac: The Future of ‘Alternative Academic’ Careers” (595). Jargon is tricky! 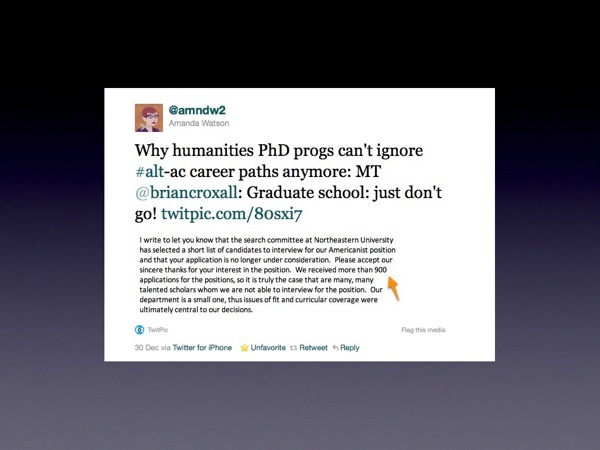 I gather then that alt-ac = Alternative Academic Careers? Makes sense, and no harm done! No impertinence intended here. I love standards and documentation, and was truly curious to know what alt ac meant, as it is a clever and engaging term! @GeorgeOnline @rogerwhitson Here you go: http://t.co/NR7EjE3q. Found it! 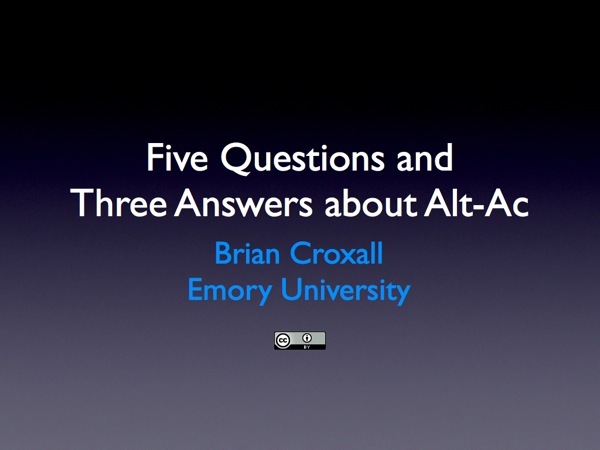 “Five Questions & Three Answers about #AltAc,” by @briancroxall http://t.co/QnCXhYHf Nice way to archive conference presentation. @literarychica @mchris4duke @katinalynn This was the thrust of my talk at #mla12: http://t.co/pSfEXnRnlj. CFP for MLA 2019: What Do We Teach When We Teach DH?